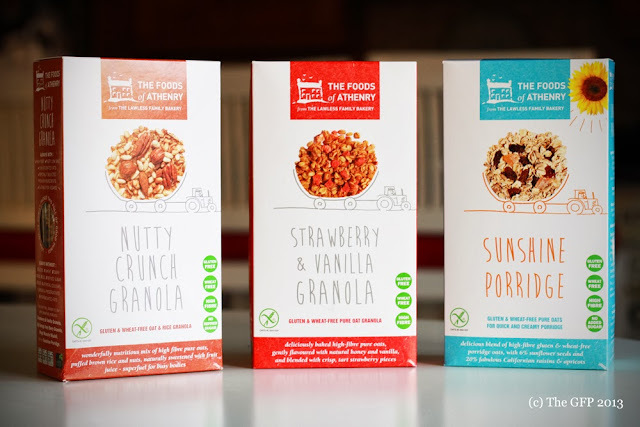 The wonderful Lawless family who are the people behind The Foods Of Athenry http://www.foodsofathenry.ie/ sent me an email inviting me to try out their new gluten free range of cereals http://www.foodsofathenry.ie/?treeid=46. Well, being a fan of The Foods Of Athenry gluten free products for a long time, how could I say no? As you can see from the picture, the boxes are marked with the cross grain symbol and have clearly written 'gluten and wheat free' on the front. I love the new packaging. The boxes are smallish in size, but the contents are filling. You don't need to eat a lot to feel full. My personal favourite is the Sunshine Porridge. Absolutely delicious. Easy to cook and I felt that it really set me up for the day. It has raisins, apricots and sunflower seeds. A great porridge. The granolas are great tasting and they don't lose their crunch when served with milk. However, it would be unfair of me not to mention that there is rapeseed oil in both of the granolas I tested and though I do not agree with the use of this oil, its effects are more or less nullified when consumed with whole milk. It's worth mentioning that the Nutty Crunch Granola won Gold in the Irish Food Awards - a granola that is gluten, wheat and refined sugar free. Brilliant that a gluten free product can win the top of a 'regular' category. The Strawberry and Vanilla Granola won the bronze.